“Everyone’s personal story begins with the moment of their conception and includes all their experiences in the womb, during birth, and in their early years. Even though we cannot remember them consciously, our early experiences leave an indelible print on our hearts and minds. Most of us have never considered how our own early story may be impacting us now, in our personal life and in our relationships with our own children. 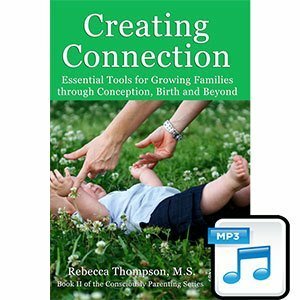 As expectant and new parents, it is helpful to understand that events from our own early lives, as well as events in our child’s early life, can have a profound effect on the connection between us. When we can understand that the beginning matters, we have more information to use when making decisions, and a new perspective to help us repair the relationship if we’re stuck. If we are parenting older children, understanding the impact of the beginning of our relationship can help us to better understand the relationship’s long-standing patterns and start to shift them. Our babies and young children need attentive, conscious parenting to help them through their emotional upsets, so they can learn to co-regulate, or regulate their emotions in connection with another person. Responsive parenting can mean following attachment parenting ideas, including breastfeeding, babywearing, keeping the baby close to you at night, and responding to nighttime needs. Responsive parenting includes noticing what is working or not working for you, and recognizing that how you feel when you are doing something is just as important as what you’re doing. If something isn’t working for you, be curious about why it isn’t and get support if you need it. As our children grow and stretch their wings a bit, they need us to continue to be responsive to their needs. We can support our children through transitions, especially when they seem to revert to younger behaviors. This is a sign that we need to slow down and connect more, not less.